In just a few simple steps you can setup a secure VPN using software builtin to XP to create a safe tunnel between a laptop and your home pc. If on your home pc you don't have seperate user accounts for each member of your family, or if you don't use passwords on your user accounts, you will need to setup a new account - with a secure password, that you use for the login credentials of the VPN. 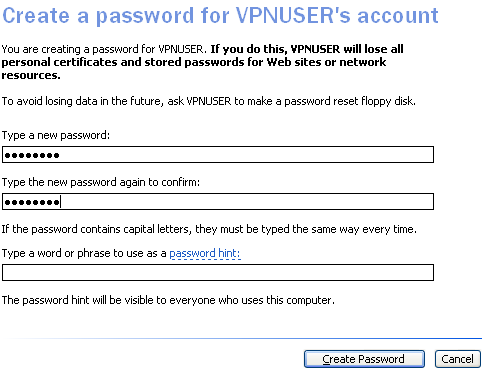 If you already use passwords on your user accounts at home, then as long as the password is reasonably secure, you can skip creating a new account, and move straight onto setting up the VPN server. 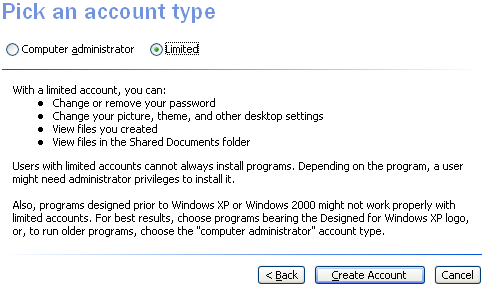 To Create a new user goto Start -> Control Panel and click on User Accounts. Click next to continue. You now need to decide whether this is an admin or guest account. Given we are only using it for a VPN it only needs to be a limited account. Next click on the Create Account button to actually create the account. You will now be back at the User Accounts page. Now we need to set a password for the new account, so doubleclick on the newly created account in the "pick an account to change" section. and enter a password in both password boxes. You can leave the hint box empty if you are good at remembering passwords. Click on the Create Password button. Congratulations, you've now completed the first step in creating a VPN connection, you've setup a username and password to use to authenticate the VPN connection. Great article that provides very clear instructions on how to setup an XP VPN.